Quilt making is a fun and rewarding activity that can be enjoyed by people of all ages and skill levels. It is an act of creation of true beauty and an expression of emotion that is captured and shown in the careful choice and preparation of fabric and in the placement of each individual stitch. The best thing about making your own quilt is that once it is finished you get to share it with your family and friends! A quilt can be used by someone on a day-to-day basis and serve as a constant reminder of the love, care and attention to detail that went into making it. For this reason many quilts are cherished and kept as heirlooms to be passed down to future family generations. 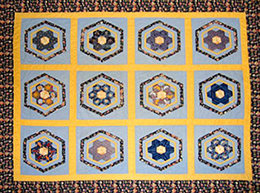 Making your own quilt is a very hands-on process that is very much a blend of art and skill. To make a quilt from start to finish can be a time-consuming process but it is not overly difficult to do as long as you do not try to rush it. The result at the end of the day is almost always worth the effort so remember just to relax and take your time! In these pages you will find step-by-step guides to help walk you through all the stages of making a quilt from start to finish. Simply start at the first page and follow as each section leads on to the next, or browse down this list to find help on specific topics that you are stuck on. Either way, take your time to enjoy the information presented here and hopefully you will find the inspiration to get started and make a quilt of your very own! The first step when making a quilt is to create a design. Start here by reading about some of the factors that may influence the design choices for your quilt. Patchwork involves joining small pieces of fabric to create an appealing pattern. Find out how to incorporate patchwork in the design of your quilt. Careful use of appliqué can really bring a quilt to life. Learn all about this technique and how to incorporate it in your own quilt design. Learn how to add that little bit of extra decoration to your quilt by incorporating embroidery in the design. Selecting the right pattern, colours and materials is a must if you want your quilt to evoke particular feelings and emotions. Read these tips to ensure you get your design right every time! Using templates is always a good idea if you have non-rectangular pieces of fabric in your quilt or are using appliqué in your design. Following these invaluable tips will ensure you mark and cut your fabric correctly and avoid accidently getting your shapes upside down! Now all your preparation is done and you are ready to go! Start assembling your quilt block by following this simple step-by-step guide. When your individual quilt blocks have been assembled it is time to sew the whole quilt top together. Find out how to use sashing to bind your quilt blocks together. Several different types of material can be used as the batting or bulk of a quilt. This guide will help you choose the right one for your quilt. Many people spend a lot of time organising the fabric for the quilt top but don’t consider the backing or binding. Although it is not seen as much as the quilt top, it is still important! Before you can start quilting you first need to assemble the quilt sandwich and pin everything in place. Here are several tips to ensure your quilt is assembled evenly. Basting or tacking can give you the ability to move around with your quilt, without having to worry about whether it is going to fall apart every time you move it! There is an ongoing debate between hand quilters and machine quilters as to which quilting method is the best. Here we help you choose which method is best for you. Hand quilting is a very time-consuming process but the results can be worth it! Learn how to use hand quilting to create your own heirloom quilt. Machine quilting can be a lot easier and faster than hand quilting and when used correctly the results can be just as impressive! At last your quilt is almost complete! Learn about the two different ways of binding the edge of your quilt and give it the finish you are looking for. Check out a great variety of beautifully illustrated quilting books, perfect to enjoy on your own or give to someone special.